A few months ago I picked up some wipe erase boards in the Target dollar bins to start the twins working on writing their names. The erase boards already have the lines neatly done on one side (and the other side is blank). Usually I will make a bunch of dotted C's and R's for Cort and Reid to practice on. Sometimes I will just do the full names in dots for them to trace. On this particular day, apparently Cort decided to boycott the name writing and go straight for portraiture. I was surprised to see that Cort had drawn the whole family (except himself). Far left is me (note my long hair) then Paul, Reid, and Pierce is the small red character riding our dog Scooter. I'm not quite sure why Pierce is riding our dog, as I've never seen him do that in real life. Cort then erased his picture and said he would work on his name. Only when I looked over next, I saw he was back to drawing. I asked who the two figures were, guessing maybe it was a picture of Paul and Cort. His response surprised me. "It's God and Jesus". How can you not smile over that one? Meh -- I'd choose drawing over name-writing any day! Cute post Lisa. Who cares if he can write his name. What wonderful drawings! I love this last one. He did come up with a good answer! What a sweetheart!! One day he will surprise you and write his name. He is quite the artist. I had to giggle at the end. How can you argue with that indeed. Cuties! Those are some sweet drawings. My daughter is a lefty and it has been murder trying to write her name. She keeps writing everything backward. Awwwww, it sure made me smile. :) And their drawings in general were darling. Aw, kids say the darnest things. Cort is a real budding artist, I think! Did you ask him which one was Jesus, the little one or the big one? I love you with the long hair!!!! He has made you into Crystal Gayle!!! 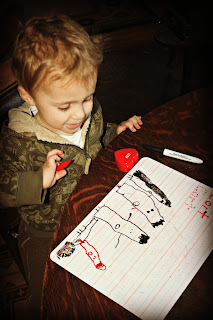 I love the dry erase boards and have many for the girls. Ella is in the hospital and I will bring her a purple one tomorrow. I also adore the Target dollar aisles. I know learning to write their names is important, but this is awesome. 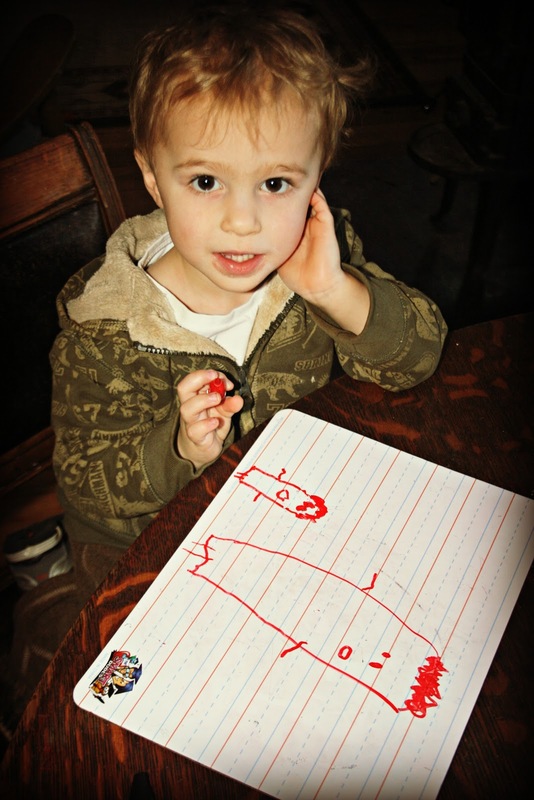 He is truly a talented artist at such a young age. And I really enjoyed the God and Jesus picture as well. Don't ever stifle the creativity! He's got pretty good drawing skills for that age. I taught both of my kids by just guiding their arms in writing. It is a hard task. The boys are soooooooooooooooo cute! Bless his beautiful (and wise) heart! It won't be long before you'll be doing a post about Cort's artwork making it to the county museum with a big ribbon on it! Glad you asked who the two were in the last picture! That was just too sweet! LOL! My grandson is 3. A few months ago I spent a small fortune on a book in Target that was Trace and Erace etc activities and the special pens were erasable. He TASTED the pen and told me it was yucky and wanted nothing more to do with the project. What a sweet moment that was! Too bad erasable...portraits you'd want to frame! At least you got pictures. He IS quite the artist! Nice family portrait! Try drawing a big letter "C" or "R" on the board and let them make a picture out of the letter. That might get them interested in writing letters. Super cute! That's a story for the memory book. OH---what a neat answer!!!! Cort is one smart little guy... Funny though that he had Pierce riding the dog! He is precious...and very talented I might add! Aww, he's talented and so sweet!